Anyone who grew up during the 1940s, as I did, was invariably caught up in the excitement of the cattleya cut-flower mania. Cattleyas were the flower of fashion and they went to high school dances with wide-eyed teenagers like me, and to state dinners with the wives of diplomats, businessmen, and presidents. It was all very grand. The fashion for cattleya corsages grew so rapidly that there was no time for commercial growers to raise a crop of Cattleya hybrids to meet the demand. Growers needed thousands of producing plants and they needed them right away. Cattleya hybrids took seven years to bloom from seed which was no help at all. The only immediate source for plants was the large-flowered Cattleya species that grew wild in the jungles of Venezuela, Colombia and Brazil, so growers began importing the species in a big way. Soon so many were being imported that you could see them everywhere. You could find whole greenhouses full of each of the major species throughout the year in facilities that were just around the corner or in your own neighborhood. Even everyday housewives knew what a Cattleya trianaei or a Cattleya mossiae flower looked like and they often ordered them by name from their florist. Having grown up in this effervescent environment, you can imagine my surprise when a member of an orchid society today asks me what a good C. trianaei or C. mossiae looks like. I just assume every orchid hobbyist knows that. Then I realize it has been over 50 years since the large-flowered Cattleya species dominated the floral world. The cattleya plants most people remember now are the hybrids that came after them as the cut-flower market matured. So I thought it would be interesting to take a broad-brush tour of the large-flowered species that made the cattleya cut-flower era possible and created the fashion itself. The best way to do this is to view the species the way commercial growers back then viewed them – by their flowering season. All the large-flowered Cattleya species were used as cut-flowers at one time or another, but eight of them were the real workhorses. Without these eight species, there would have been no supply of flowers to meet the early consumer demand for cut-flowers. These species were the most plentiful in the jungle and had the necessary qualities to fit the market. As soon as the summer vacation season ended in early September, the social season began and cut cattleyas were in demand for all the important events from vase arrangements for private parties to corsages for women to wear to a new play, the opera, for cocktails or a fancy reception. A woman wasn’t really properly dressed in those days unless she wore a cattleya corsage to many of these affairs. A woman at a dance without a cattleya corsage was like a woman without her shoes. Cattleya labiata was the first large-flowered Cattleya species to flower as the social season opened in September and it was in-season for most of the autumn months. It made a great cut-flower because the flowers were large, the petals were upright and the species had a wide range of color forms from pale lavender to dark purple so no woman was embarrassed at an affair by finding another woman wearing the exact same flower. C. labiata flowers also lasted well. The flowers were cut on Tuesday or Wednesday and shipped to wholesalers to arrive at florists on Thursday. The florists made them into corsages for weekend events and the flowers still looked bright and fresh even when they arrived at their final destination as late as Sunday afternoon. The flowers usually lost their delicious fragrance by the second day after being cut and refrigerated, so the customer was seldom aware the flowers had fragrance, but that didn’t matter because the flowers were so large and beautiful in their lavender gowns with their delicate, feminine appearance and everyone loved them. C. labiata was “light controllable” which meant you could bring it into flower earlier or later than its normal season depending on how you manipulated the length of daylight in the greenhouse with shade cloth or lights. C. labiata flowers usually disappeared from the market by late November, however, and another species was needed to provide cut-flowers in December. The December species was Cattleya percivaliana. Some varieties of C. percivaliana began flowering in late November and the rest came along right up to Christmas. C. percivaliana’s rich purple flowers with their orange and yellow tones in the lips, fit well in a Christmas tapestry, a wreath or an arrangement of evergreens and pine cones. Florists were not always happy with C. percivaliana, however, despite its Christmas colors because the flowers were much smaller in size than C. labiata and they had a spicy fragrance that not everyone liked. Some varieties of C. percivaliana, however, were as large as C. labiata and made good corsages. Lager & Hurrell’s clone ‘Summit’ was one of these and Lager had over 200 plants of the clone for Christmas cut-flowers when I visited them during the 1950s. C. percivaliana was also sold as a pot plant for Christmas during the 1940s because it was relatively small and compact and produced a beautiful display of flowers in a modest 5 inch pot. As the New Year arrived, so did Cattleya trianaei. The earliest varieties began blooming in late December and the last ones opened the end of February. C. trianaei was a great favorite of orchid hobbyists because many varieties had large, well-shaped flowers that made them great exhibition plants. Florists also liked C. trianaei because its flowers had such lovely pastel shades of lavender and the species was very long lasting. C. trianaei also had a thin, delicate substance that oozed femininity. C. trianaei produced only two flowers on a spike, but it made two growths in succession each season and both growths flowered at the same time, so the species made money for growers. Commercial growers vigorously divided and multiplied the best varieties of their large-flowered Cattleya species and you could often find blocks of 20 or 30 plants of the same clone in many greenhouses. This happened frequently with C. trianaei. The word “best” applied not only to plants with the largest and nicest shaped flowers, but also to plants that bloomed for high volume holidays like Thanksgiving, Christmas, Easter and Mother’s Day. The reliability in the blooming dates of individual clones of the species is legendary and, as an example, Cattleya mossiae ‘Mrs J. T. Butterworth’ flowered faithfully for me on Mother’s Day for 50 years. C. percivaliana alba ‘Christmas Cheer’ always flowered on Christmas and C. trianaei ‘Party Time’ always flowered for New Years. In late February, Cattleya schroederae made its appearance with the same long-lasting qualities as C. trianaei. C. schroederae was more floriferous than C. trianaei so growers liked it. C. schroederae had the same good shape as C. trianaei, but most flowers were very light lavender without a lot of variation in color which limited their usefulness. C. schroederae extended the C. trianaei season long enough to give it a permanent place in the flow of cut-flowers. As spring approached in the month of March, the greatest of the cut-flower species, Cattleya mossiae, began flowering. C. mossiae produced large flowers up to 8 inches across and as many as five on a flower stem. It was easy to grow and flower and was such a heavy bloomer it sometimes flowered itself to death. C. mossiae had a long season that lasted from early March through the end of May. A few varieties even began flowering in February, and a commercial friend of mine had one variety that always flowered in June. C. mossiae was in bloom for all the flower shows and spring social functions. It was often referred to as “the Easter orchid” because it was always in bloom for Easter no matter what date Easter came on. Although it had petals that did not stand up straight but drooped slightly downward, the petals were wide and florists could make just as good corsages with them as they could with C. labiata or C. trianaei. C. mossiae was so popular as a cut flower because of its beautiful shades of bright rose-lavender. The color actually came to be called “orchid color” by the general public. C. mossiae’s biggest asset, of course, was its flowering season. It bloomed when demand was greatest for cut-cattleyas. Since demand was highest at Easter, growers actually worked out a way to bring the plants into bloom the week before Easter. 22 weeks before Easter they would drop the temperature to 52 F at night in their C. mossiae house for 4 weeks. The temperature was then raised to 60 F at night to let the plants set buds, and a month before Easter, the temperature was raised to 65 F and all the plants bloomed for Easter. C. mossiae was such an important flower that a number of growers made sib crosses to try to improve on nature and provide more plants and C. mossiae became the primary species used to create spring-flowering Cattleya hybrids. Without C. mossiae, spring hybrids would be few and far between today. Two of the most famous hybridizers of the species itself were John Mossman on the East Coast of the United States and Rapella Orchids on the West Coast both of whom produced outstanding strains of C. mossiae. C. mossiae remained a major cut-flower orchid long after the other large-flowered species had been replaced by larger and more richly colored hybrids. As C. mossiae flowers began to diminish in number in mid-May, Cattleya gaskelliana began to bloom and continued to flower into mid-June. C. gaskelliana was a mixed blessing for commercial growers. It was the only large-flowered species that was available in quantity to fill the late-May to early-June period, so growers had to have it. The flowers were fairly large, but under the intense heat of a June greenhouse, C. gaskelliana was often short-lived, lasting only two weeks in bloom compared with C. mossiae that lasted 3 or 4 weeks and C. trianaei that lasted 5 or 6. C. gaskelliana also had a narrower range of color forms than the other Cattleya species. Most varieties were a light to medium lavender with few exciting lip patterns. Although a few dark clones existed in private collections, there were no dark varieties available for cut-flowers. In mid-June, the imperialis varieties of Cattleya warscewiczii began flowering. The species was only known to commercial growers by its common name Cattleya gigas (pronounced g I’ gus). Although C. gigas had large beautiful dark purple lips, the petals were generally narrow and the flower did not make as good a corsage as C. mossiae or C. trianaei. The plants were in plentiful supply, however, and were an important cut-flower because June was the wedding month and even lavender flowers were needed at times for weddings. C. gigas had better lasting qualities than C. gaskelliana under hot summer conditions and, except for its narrower petals, C. gigas was a great cut-flower. With both the imperialis and sanderiana forms of C. gigas, the species was usually available through the end of July. August was not an important month for cut-cattleyas but there was always some demand, and Cattleya dowiana filled the need during this vacation time. When I was 16 years old in 1946, a commercial grower I worked for during the summer was still importing 600 to 800 plants of C. dowiana a year for the August cut-flower market in Philadelphia. Florists liked the yellow petal - dark maroon lip coloring of C. dowiana, but commercial growers found the species a nightmare. C. dowiana only lasted in bloom a little over a week in a hot August greenhouse, and many plants rotted over the winter because they were kept too wet so that none of the original plants were alive after 4 years. 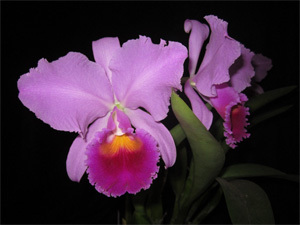 By the 1960s most of the large-flowered Cattleya species had been replaced by larger, more richly colored and better shaped hybrids and, except for C. mossiae, the species disappeared from the commercial cut-flower market. The sad thing about this story is that as Cattleya hybrids replaced the large-flowered Cattleya species, the species were just discarded, usually thrown out on the commercial grower’s dump to die. Back in the 1940s you could buy a well-established, good variety of Cattleya trianaei in an 8 inch pot with several flowering-size leads for $3, and you could import a few thousand large plants for $1.50 each. Today a four-bulb division costs from $50 to $75 and you might have trouble even finding one. Fortunately orchid hobbyists still actively grow C. trianaei and all the other large-flowered species despite the problems of acquiring them. Some of my friends like to speculate now and then on whether the public will someday rekindle their interest in wearing cattleya corsages. Fashions do change, they argue, and cattleya corsages could come back when enough time has passed. They may be correct in this, but if the fashion for cattleya cut-flowers should suddenly reappear, it will be interesting to see how commercial growers handle the problem of supplying the flowers needed to make it work. It still takes 7 years to grow Cattleya hybrids from seed to flowering, and there are relatively few of these hybrids left in cultivation compared with the number that supplied the market in the 1950s and 1960s. The supply of jungle plants is now so badly depleted that the Cattleya species are simply not available for export from their native countries in any meaningful quantities. A more probable conclusion says that the cattleya cut-flower era was a one-time event in orchid history – memorable, but like a great wave, it rose, crested, and disappeared forever in the endless ocean of time.